Southern Virginia’s Patrick County starts in the south with the rolling hills of the Piedmont and progresses north to the rugged Blue Ridge Mountains. 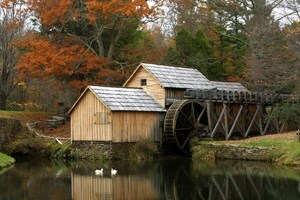 The county is rich in tradition with beautiful vistas and covered bridges. Both residents and tourists enjoy the parks, historical sites, museums, and the friendliness of the mountain communities. Besides being a wonderful place to live, work and/or retire, there are plenty of activities, parks, and recreation right at your fingertips. Cruise the Blue Ridge Parkway or visit Philpott Lake for boating, fishing, swimming, and camping. If you’re a sportsman, visit the 14000 acre Primland Resort – a sportsman’s paradise, or go trout fishing or kayaking at Kibler Valley. And, don’t forget the winery tours at Chateau Morrisette, Villa Appalaccia and Stanburn Winery. Stuart is the county seat of Patrick County and hosts the Virginia Peach Festival every August. There are six smaller communities in Patrick County – including Critz, home of the historic Reynolds Homestead. Musical events and agricultural festivals are part of life in Patrick County. If you’re interested in Patrick County and you are looking for a recreational/hobby farm, a home with acreage, a rural land tract to build your dream home, or a great home in one of Patrick County’s small communities, call Virginia Farms & Homes. Listing and selling rural properties like these is our specialty and niche. Give us a call.